* This is a different motion backgrounds collection and is different from the one we offer before. * You will be given a chance to get very limited resell rights license through the OTO, we have never offer resell rights license before for this motion backgrounds collection so this is a very unique offer that you won’t want to miss! 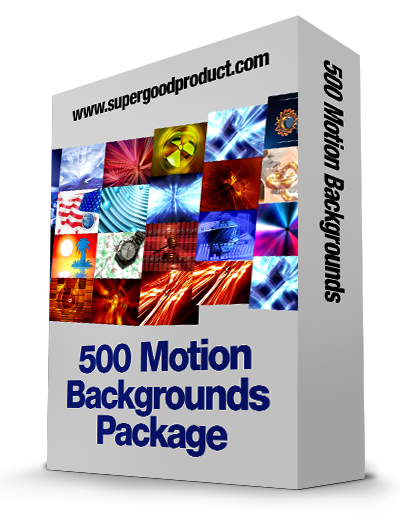 What is the 500 Motion Backgrounds Package? The 500 Motion Backgrounds package is a collection of 500 varieties of different motion backgrounds that you can use in your video project, presentation or any rich media project. The motion backgrounds come in different themes such as abstract, industry, space, animation, computer and many more. View the following video presentation preview to get a glimpse at what you will receive with the 500 Motion Backgrounds package. * Due to the size of the collection, we only pick some of the motion backgrounds for preview above. The collection is packaged with 500 Motion Backgrounds. Collection of total 500 motion background videos. Collection cover wide varieties different of themes such as abstract, technology, futuristic and many more. Each video come with a wide screen and on wide screen version. Aspect ratio is 864 X 486 for wide screen and 720 X 486 for non-wide screen. All videos are in .avi format. Get the 500 Motion Backgrounds Package Now For a Ridiculous Promotion Price of Just $29.95! This limited time offer will expired after 13th September 2014. This is a special promotion offer for our existing customers only and this offer is valid strictly until the 13th September 2014 only. After this offer expired, you will not be able to get this package at such a low price anymore. This 500 Motion Backgrounds package is unique and have not been offered on our website or to our customers or subscribers before. All the motion backgrounds in this package are of standard definition resolution, NOT High definition. You will receive Royalty free license with the product that allow you to use the videos in any of your personal or commercial project including using the videos in project that you intend to sell it to your clients as long the video is an integrated part of the completed project. You cannot distribute or resell the videos to your customers or anyone.